Thirsty Pilgrim: Eating Like a Gentleman From Liedekercke. Since one of the world's most legendary restaurants for beer lovers is only a half-hour away, we're ashamed we've only been there a few times. Our lunch there on Saturday helped a bit. With luck and planning we'll get back there again soon. I'm talking about the Heeren van Liedekercke, which despite the name is just barely in Denderleeuw. (Liedekercke is on the other side of the creek.) 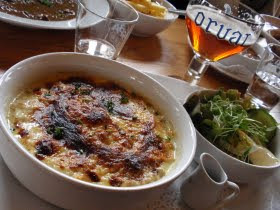 The specialty here is hearty and traditional Belgian cuisine, creatively done, and cooked in beer often as not. Then there's the standard list of 300+ bottles with an emphasis on smaller breweries. Those facts alone would be enough to make the place great. What makes it legendary is the cellar. A multi-page list printed on A4 computer paper tells a long story of vintage lambics, Trappists and other gems. There are still a few Rodenbach Alexanders down there. Old Rocheforts and Westvleterens. The sought-after Drie Fonteinen J&J geuzes. And plenty more. I settle on a 5-year-old Orval next to my "Orvaliflette." It is what it sounds like: tartiflette made with the ale. The Orval is floral as always, subtly tart, but naturally the bitterness and carbonation have softened. In my view this makes the pairing less than ideal, since that zip can help scrub the cheese and fat off the palate. But like any beer, it was compatible enough with a mish-mash of potatoes, cheese and bacon. Nothing can go wrong there, so it's only a question of how right. And this was very, very right. Atonement can be damned tasty sometimes. 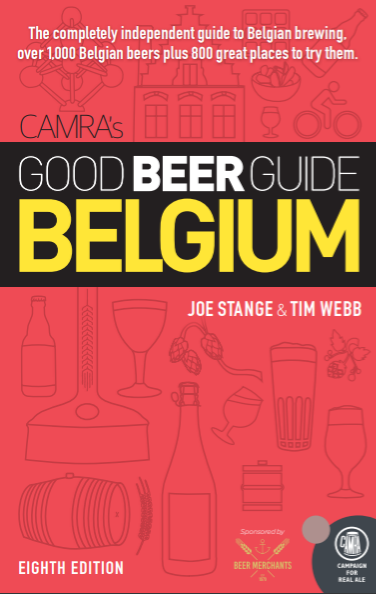 *Obligatory head nod to Tim Webb's Good Beer Guide Belgium, which brought us there for the first time nearly three years ago. I think the most incredible thing is the little numbers next to every beer on the vintage list, saying how many of that amazing treasures are left in the cellar.